We had so much rain in the last 2 days that I sort of feel like a fish! 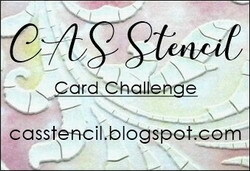 But I used this title to describe my tall card that I made for today's sketch challenge on SCS. As per the challenge instructions - the card is a 9 1/4" x 8" piece of white PapertreyInk cardstock that I scored at 4" and folded in half. This will fit into a regular business size envelope so does not require extra postage. Then I cut off a 3/4" piece from the right hand side of the front of the card so you can see the inside of the card there. The instructions were to score it at 3/4" and fold it under - but I decided to just cut it off so it wasn't bulky. Then I cut 2 ovals with my nestabilities and dry embossed them. I stamped my 2 fish on the white oval using Summer Sunrise ink from Papertrey. Then I masked the bigger fish by stamping it on a piece of paper, cutting it out and laying it over the stamped image on the oval. I stamped the sea grass on the oval using Desert Sand ink from Close to My Heart. When I removed the mask - it looked like the grass was behind the fish. Next I stamped the bubbles with Aqua Mist ink by Papertrey, and finally the sentiment in Onyx Black by Versafine. All of the stamps are from the new PapertreyInk Set called Pond Life. I attached the white oval to the Aqua mist scalloped oval. For the ribbon - I first punched a slit on the left side of the ovals then cut a piece of ribbon 19" long. I put the ribbon behind the DP on the left - came up on the right side and brought it through the slit - then I attached the paper to the card and the oval to the paper checking my placement so that the oval extended over the cut off front but not past the back edge. And finally I tied the bow. I attached 4 clear dew drops - 2 on the top left and 2 on the bottom right. I computer generated a sentiment that I found on a verse web site and attached that and a strip of DP to the inside. You can see a close up below. This card also covers the Double Dare Challenge I do with some friends each week on Split Coast. Fran gave the challenge this week - to make a Mother's Day card with a bird or animal on it. I'm hoping fishies pass for animals!!! Today's quote from Poor Richard's Almanac: "A good example is the best sermon." Well - we got our rain today! It has been pouring since about 11 am. We really needed it as it had been so dry we were having a lot of brush fires in all the surrounding communities. but I was also able to get to stamping earlier than usual! What a fun Try a New Technique challenge today! A two way fold card. Briefly, you cut a square 4 1/2 x 4 1/2 as the base - then you add an 8 x 4 layer folded in half - that you cut the front off at an angle - then you add another layer inside 3 1/2 x 7 folded in half. You can see the instructions here. I added a belly band to hold it closed (some people added a ribbon). The belly band is 11" x 1" and scored at 3 3/8" and 8" - overlapped and closed with adhesive. I added circles to the band to dress it up a bit. I used PapertreyInk pink papers - I just love the colors and patterns on these. Thought for today from Poor Richard's Almanac: "A house without woman and firelight, is like a body without soul or sprite." I hope everyone had a blessed Sunday today - I've been away all day so I'm posting late and really should be in bed! I seem to be saying that on every post - can you get the idea that I'm a late night stamper!?!? It was a cloudy day here - we really need rain but only got a couple of sprinkles - some showers are supposed to come tomorrow and Tuesday. 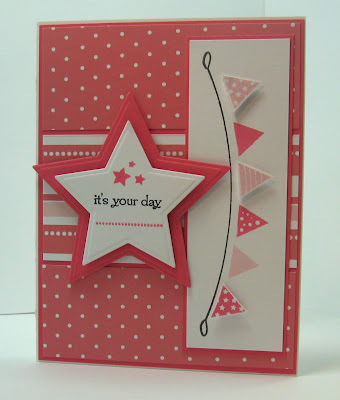 My card today was made for the Featured Stamper challenge over at Split Coast. Today's featured stamper was Michelle (Sf9erfan) who has a delightful gallery of cards - I chose this card to case (Copy And Selectively Edit). I changed the colors and stamps used and punched the butterflies instead of using a stamp - but kept the layout the same. I thought this was a lovely birthday card and I got to use my favorite new butterfly punch again! I used Arctic Ice Stickles on the wings for a little shimmer and colored the bodies with a black sharpie pen. They are attached to the panel with glue zots and creased to make them 3D. 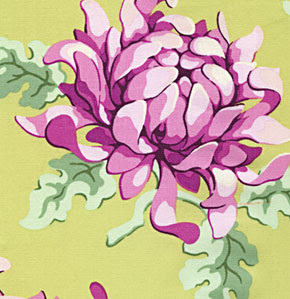 The great ruffled ribbon is from Flourishes. Thanks so much for stopping by to check in with me today - I really appreciate it! Today's thought from Poor Richard's Almanac: "You may delay, but time will not." Accessories: glue zots, green ruffled ribbon: Flourishes, butterfly punch: Martha Stewart, arctic ice stickles, black sharpie pen, dimensionals. A Sketch, A Double Dare, and an Inspiration! Sorry I haven't posted for a few days - I've been making cards - just not having time to get them loaded here! Last night my niece, Christie, invited 7 friends over to her house and I went and ran a card stamping party for them. They each made 4 cards. We had a great time but it was a late night with all the chatting, munching and wine tasting going on! So here are two cards for you to check out! I made this card for Wednesday's sketch challenge on SCS as well as a weekly double dare I do with some SCS friends. Sleepyinseattle's dare was to make a card that involved music. I used my brand spanking new stamp set called Pond life from PapertreyInk with the cute Hippity Hop sentiment (like 'at the hop' - a dance - music - get it??? LOL!) I stamped the reeds on the Summer Sunrise panel with my versamark watermark ink so it's just a suggestion. And I used my brand new Martha Stewart butterfly punch (after seeing it so much on No Time To Stamps cards I finally broke down and got it!!) The music DP is from Provo Craft. My next card is for today's Safari Adventure Inspiration challenge by Stef as well as Beate's weekend sketch challenge found here. 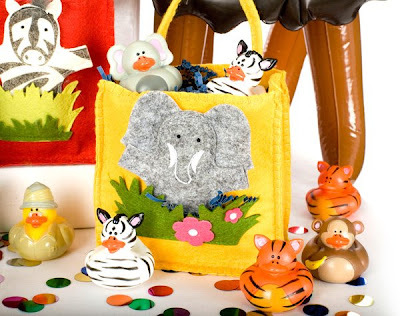 Our inspiration was this picture from a Party in a Box website she found. I was inspired by the animals, bright colors and circles! I used this cute hippo stamp from Rubber Soul and fun big eyelets. I dotted around the image with my Prismacolor markers. I'll be loading up some ATC's later so be sure to check back. Thanks for dropping by today! I really need to go out and do some gardening now! Spring is coming and there's lots of winter mess still out there amoung the shoots that are finally coming up! Today's thought from Poor Richard's Almanac: "If thou would'st live long, live well: for folly and wickedness shorten life". Origami Butterfly Tutorial - Take A Deep Breath! I posted this origami butterfly card last week and many of you asked if I could do a tutorial on it. So here it is! With Origami you really need to see each step clearly as it can be confusing the first time you make anything. There are 11 steps shown here! I suggest you use a piece of plain computer paper the first time you try to make this butterfly. Once you get it - you can whip them out in just a couple of minutes! It may take a few tries to figure out the folds so don't get discouraged. I hope my pictures help you visualize them. To make the small butterflies that end up to be about 1 3/4" x 2 " I used a piece of Origami paper 2" x 3". I purchased my paper at The Paper Source but there are many places to get it. I like the colors/patterns they have and you can see all of the pieces that you are buying - most packages you only see the first and last piece so you're not always sure what's in between! For this tutorial I'm using a piece of Origami paper 4 x 6 and it makes a butterfly about 3" x 4". I made this one bigger so you could hopefully see the steps better. The smaller 2" x 3" size is best for regular size cards if that's what you are making them for. You should use a piece of double sided Origami paper - ie. printed on each side - since both sides end up showing and it makes it more colorful. Note: Although you can use any kind of paper, it needs to be light weight so you can make good creases and folds. Origami paper is best. So - let's take a deep breath and get started on it! 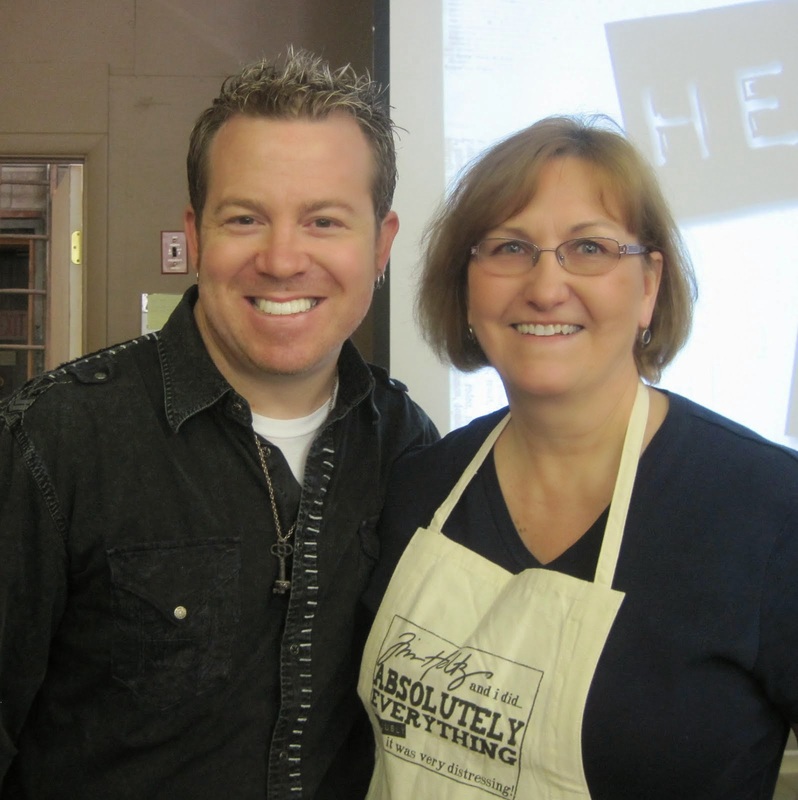 My husband, Kent, was the photographer for me since both of my hands were busy!! Step 1: Hold paper with the longer side at top and bottom, front side up. Step 2: Fold in half bringing top down to meet bottom and crease. Step 4: Fold in half bringing the top down to the bottom and crease. so it makes a triangle. Step 7: Lift up the right side to the center and squash fold this side - pushing the top down to form a triangle. Step 8: Rotate it so the triangle is at the bottom. Step 10: Now unfold those creases you just made - open the layers at the top and push the edge inside on the same creases (push where my right index finger is) - this is called a reverse fold. Do this on both sides. It will now look like this. We're almost done! Step 11: Fold down the front wings from the top on each side. And here is a 5 x 5 card I made to show you a large and 2 small butterflies. I used this designer paper as background as I thought it looked sort of like the bark of a tree where butterflies might be hanging out! Please let me know what you think of my tutorial and if you make some butterflies please link back here so I can see what you created! Thought for the day from Poor Richard's Almanac: "The good or ill hap of a good or ill life, is the good or ill choice of a good or ill wife". Hope you are all having a wonderful Sunday! It is just beautiful here today - sunny and 60 degrees but it feels warmer. Yesterday was supposed to be 70 but it never got there and it felt chilly out even in the 60's. 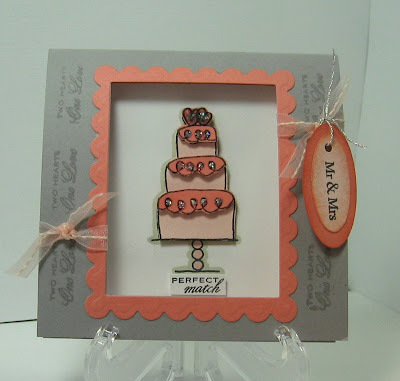 Every Sunday at Split Coast Stampers the challenge is a Featured Stamper - where someone is chosen and we look at their gallery and make a card like it but changing a couple of things. Today's featured stamper is Sparklegirl. You must check out her gallery! She also has a wonderful blog. Both are just super! I found at least 10 cards that I want to copy but for today I chose this card . I liked this card for several reasons - first, I just love this stamp set, Essence of Love from Stampin Up - and I recently bought this beautiful Stampin Up ribbon (actually bought it in 4 different colors!) and haven't used it yet - and I also love the Marker Water Misting technique used on this where you color the stamp with your markers, mist the stamp with a water bottle and then stamp it on your card stock. It creates an image that looks sort of like a watercolored painting. My changes are: I used different colors and a different sentiment (by Darcie) and I didn't add brads beneath the sentiment. This is a fairly simple card to put together but I think it is just stunning don't you? So - I also want to let you know about the play I told you we were going to see yesterday. It was called "The Cry of the Reed" . It was quite interesting about a young journalist from the US who goes to Iraq to do some reporting but gets taken hostage and it involves getting in touch with her mother who lives in Turkey and is a devout Muslim (they haven't spoken for 10 years). It showed some interesting viewpoints and was very well acted. We are subscribers to the Huntington Theater - so we see 6 plays a year. It's our 'date night' and we see plays we might not think of going to see otherwise! Have a great rest of the day - and thanks so much for stopping by! Happy Saturday everyone! Here in MA it is bright and sunny and supposed to be in the 70's - yahoo!! Kent and I are going into Boston this afternoon to a see a play called "The Cry of the Reed" I'll let you know how it was tomorrow! And I made this card. As promised yesterday - here is the cute little origami dress that is another pattern in the wonderful book I just got (see yesterday's posting for the butterfly and information on the book). I had some origami paper that was close in color to the inspiration piece and it had flowers on it so I used that for the dress. I used my cuttlebug to dry emboss the purple panel. I added primas and a flower brad to the corner. The ovals are cut with nestabilities. The oval and sentiment are attached with dimensionals. Thanks so much for coming by today - I'm off to the play - see you tomorrow with my featured stamper card! Spring has Sprung and a Mistake was Made! Thought I'd share with you some of the lovely plants that are finally blossoming in my gardens. 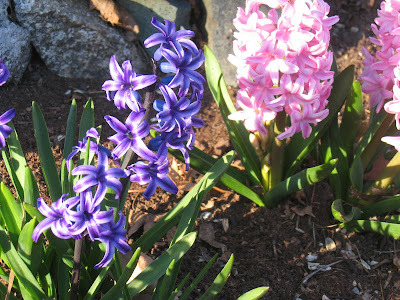 These are several hyacinths that I planted a couple of years ago after receiving them as gifts at Easter time. Don't you just love their wonderful fragrance? 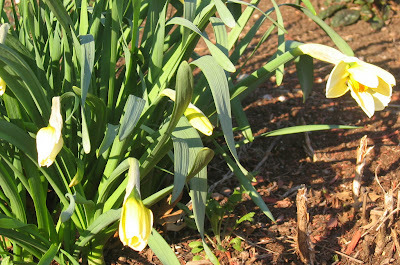 And here is a cluster of Daffodils that are just starting to open. Daffodils really are the harbinger of spring for me - when I see them being sold at the fruit stands on the streets of Boston on my way into work - I know spring isn't far away! Butterflies are another sign of warm weather so I put them on my Mother's Day Card today. I just got a wonderful mini origami book at Borders Books and one of the patterns is this gorgeous butterfly! You can make any size - it's just determined by the size paper you start with. The book is called Minigami, and it's by Gay Merrill Gross - published by Firefly Books 2005. You can see it here at Amazon.com but I'm sure you can find it lots of other places. The instructions for the challenge today were to limit layers and embellishments and so - since these Butterflies are pretty dramatic (I think!) - I didn't add anything else accept the origami paper panels and the sentiment. The sentiment is from the Women of Life set by PapertreyInk. Here is a close up of one of the butterflies. I'll have some cards with a beautiful origami dress on it sometime this weekend so be sure to drop by and check it out! Happy Friday everyone! So - this time I stamped the butterflies - actually I colored the stamp with Stampin Up markers - Perfect Plum and Almost Amethyst - spritzed the stamp with water and then stamped them on white card stock. It's called misting with markers and you can see a tutorial on SCS here. I used my sponge dauber with Groovy Guava on the wings. I cut wire antanae, attached them to the back, scored down the middle of each butterfly and curved the wings around my finger. I attached them to the purple bazzill card stock with zots to hold them on well. This card also qualifies for Sharon's (NoTimeToStamp) Friday challenge to use Black as an accent on a card. You can see her challenge here. 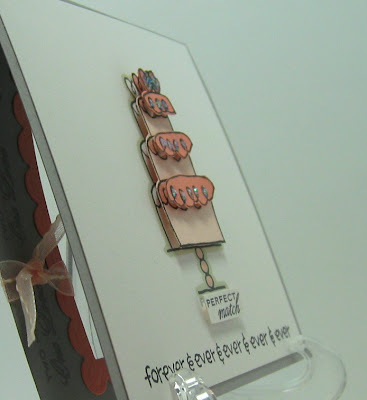 Sharon's trademark is to keep it simple and her cards are wonderful - so check them out when you go there! So - I feel better after confessing my mistake and submitting a new 'following the rules' card LOL - now I can sleep tonight!! Wow! What a sweet and awesome engagement proposal that was! Congrats to Katie & Greg! And congrats to you as well on your 5000 plus hits! Cute stamp! Reminds me of my dad - he loves to golf! I'll be e-mailing you for your mail address so I can get the golfafella out to you right away! 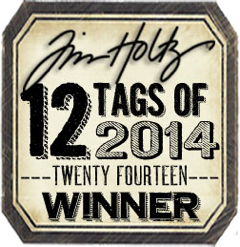 Congratulations on winning and thanks to everyone who left a comment. Now onto my card for the day which I made to cover 3 challenges over on Split Coast. First, it was for today's sketch challenge and for two Fan Club/Dirty Dozen Challenges. The inspiration I took from the picture was the colors and the tea theme. The pretty rose button was from my MIL's button box that I inherited when she moved into assisted living and the green ones looked like leaves to me with the slot shapes in their centers. I'm not going to think about how I will ever get this into an envelope if I mail it to someone! Maybe it will be a card I hand to someone - LOL!! I used the script cuttlebug folder to represent the words on the boxes (not sure you can see that on the inspiration picture) and my corner rounder punch for the scalloped edges on the box covers. I used my nestabilities to cut the squares for the teapot image. Congrats again to Bunny b and thank you so much for dropping by today -Hope you have a wonderful evening and see you tomorrow! This is a card I had submitted to the PapertreyInk April Guest Star Designer contest. I used their It's a Celebration stamp set and all Papertrey papers on this card. I didn't win but I did make Honorable Mention! See it on Nicole's Blog ! I love these flags that include the rope they are strung on. I cut out and popped up every other flag along the line. I cut the stars with my nestabilities using white and Berry Sorbet card stock. I love the deep color of this paper. The designer papers are from the Pink Patterns collection. You really need to try the Papertrey cardstock if you haven't already - it is a nice heavy weight so the cards stand right up and don't curl or bend. Thanks for checking out my card today - I'd love to hear what you think of it! I got this nice thin wooden box at AC Moore for $1.99 and I covered it with Papertrey Designer paper from their Pink Patterns collection. I stamped flowers and Mr & Mrs on the outside corner of the envelopes. All the stamps are from their Wedding Day stamp set. I glued Berry Sorbet dotted ribbon around the edge of the cover. The flowers on the top are from Michaels. They are in the Wedding section and come in a clear pail and are called wedding confetti. I sponged them with Sweet Blush ink, curled them a little on my finger and punched a circle out of Berry Sorbet card stock with my hole punch for the centers. I added Crystal effects to the centers to give them dimension and shine. I lined the inside cover and bottom of the box with another of the pink pattern designer papers. I made the thank you cards with Papertrey white and Berry Sorbet card stock, 2 nestability squares, Berry Sorbet dotted ribbon and the Many Thanks stamp from their Wedding Day set. I also embossed a square frame on the white card stock behind the nestability squares (you can see that best on the first picture above). Thanks for taking a look at my project! 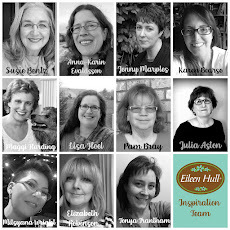 First - let me remind you to scroll down to my Friday post where there is some Blog Candy to be won! 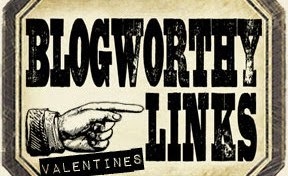 Leave a comment before Wed at 10 pm on that post for a chance to win! I made this cute coaster book for my friend Kelley whose daughter, Eden, is my Godchild. These are pictures from Easter Day at our church and include her brother, Destin and other children from church. The coasters are 4x4 and I punched and bound the book using my Bind It All. The paper I used to cover the coasters is Phoebe from Basic Grey. I love the bright colors on it! I used my corner rounder on the paper and sanded the edges with my sanding block from Stampin Up after I attached it to the coaster. 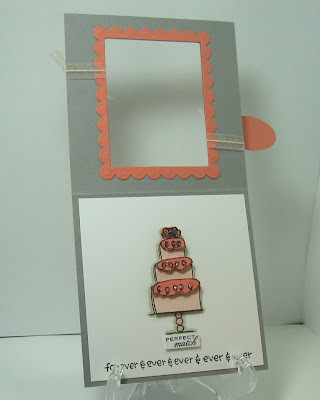 The chipboard accents throughout the pages are from Crafty Secrets. They sent me a package of them free with my last order - how sweet was that?!! I just swiped my Cameo Coral Ink over them. I added brads to the prima flowers and attached them with dimensionals to the frame. So this is Destin and Eden - first standing by the flowered cross (the kids bring in flowers on Easter and put them inside the cross - after the service we put the flowered cross on the front steps of the church so passers by see it all day! And then we see Destin showing me how he can hang off the branch of this tree! Here are the kids standing outside on the church steps - of course my focus is on sweet Eden and her lovely dress! The girls on the far right are my friend Elizabeth's twins - Gweneth and Paige. They all looked so pretty (and the boys looked handsome!) in their Easter outfits! I love making these cute photo books - thanks for taking a look! Supplies: Computer generated title, Bind It all, 3/4 white wire, sanding block, corner rounder, primas, brads, circle punch, oval punch, Sweet chips Chipboard - Crafty Secrets. An Engaging Card and Fella Bella Blog Candy! I've Been Tagged Again - 7 More Things About Me! Ten Little Toes and a New Pair of Shoes! You Rub Me the Right Way! I Received the Arte Y Pico (Art & More) Award!